It might not sound massively appealing, but bone broth and meat stock really are where it’s at. 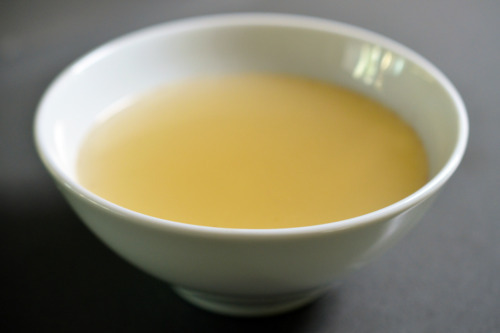 Broths are yet another very nourishing tradition that are being revived and brought back to our kitchens. They’re undeniably one of the most healing things you can feed yourself and your loved ones, and so inexpensive and easy to make, it’s time to drink it up! Having scarcely eaten meat in the last 10 years, it felt very odd, but gradually very right, to start reintroducing it slowly back into my diet. Tired of suffering from minor but persistent hormonal disturbances and other related issues, I finally took courage and reduced my beloved carbs and swapped them for more animal fats and proteins. It has been a year since this change and I can’t say enough just how much better I feel (and how amazingly little I miss grains/carbs). Clients and friends who follow a similar program have also experienced wonderful healing. Of course, not everyone believes in eating animal products which I absolutely respect. However, if you do eat meat products, I urge you to give this a try. I attribute a lot of my understanding and healing to the work of Dr Natasha Campbell McBride and her GAPS protocol. She is an incredible doctor who continues to cure thousands of children from a multitude of ailments such as autism, dyspraxia, dyslexia, allergies, A.D.D, and depression. This protocol is not exclusive to children, with people of all ages healing the likes of rheumatoid and osteoarthritis, auto-immune diseases such as Chron’s and Hashimoto’s, OCD, chronic fatigue and asthma. To briefly fill you in, the GAPS protocol follows the idea that all diseases (physical, mental and emotional) begin in the gut. Thankfully this understanding is becoming more and more mainstream. The gut serves as your second brain, it produces more serotonin (the feel-good neurotransmitter) than your brain and contains ten times more bacteria than there are cells in your body! So yes, we are in fact 90% bacteria. When you heal and seal your gut lining by balancing the bacteria in your gut you can heal your whole system. Bone broth and meat stock is hailed by Dr McBride and many other medical practitioners as providing your body with the necessary building blocks to provide wonderful healing. So what is broth and meat stock? They are mineral, amino acid, and vitamin rich clear soups. Broth is made by boiling raw or cooked bones of healthy animals, and meat stock is made by boiling the raw meat of healthy animals on a bone. Bones are so rich in nutrition as they are where the likes of iron rich red blood cells, immune support white blood cells and elastic collagen are produced. When you boil the bones these wonderful properties, undisturbed by heat, are drawn out. Calcium, magnesium, phosphorus, sulfur, sodium and potassium – all essential for the daily functioning of our body and gut and also act as electrolytes – could broth be the new sports drink?! Proteinaceous gelatin – aids digestion by attracting digestive juices. Brilliant for intestinal disorders and allows the body to fully utilize proteins that are taken in. Particularly useful for anemia, diabetes and muscular dystrophy. Cartilage – incredibly healing in treating cancer and bone disorders. Collagen, hyaluronic acid, chondrition sulfate – all support connective tissue elasticity such as joints, tendons, ligaments, skin, mucus membranes and bone. Very healing for rheumatoid arthritis and joint pain…..and yes helping with wrinkles, stretch marks and cellulite too! STEP 1: Put the joints and bones (with or without meat) into a large pot, fill it up with water, add pepper and good quality salt. STEP 2: Heat up to boiling point. Cover the pot and reduce the heat to a minimum. Simmer for at least 3 hours. STEP 3: Turn off the heat, take out the bones (and meat) and pour stock through a sieve. STEP 1: Put a whole or half chicken (with or without meat) into a large pot, fill it up with water and add salt. STEP 2: Simmer for 1.5 – 2 hours. STEP 3: Take the bones (and meat) out and pour stock through a sieve. Chicken broth/stock is particularly good for flu, colds and asthma as chicken contains a natural amino acid called cysteine, which thins the mucus in your lungs making it less sticky and easy to expel. STEP 1: Add fish bones, fins, skins and heads (no meat) to a large pot with water and add pepper. STEP 2: Bring to the boil. Reduce heat to a minimum. Simmer for 1-1.5 hours. STEP 3: Add salt to taste. Take the fish out and sieve the stock. Great for virility! Rich in iodine supplies, thyroid hormone and other substances that nourish the thyroid gland. Increases energy and restores mental abilities. Ask your local butcher and ask for all the discarded bones and joints – they may even give them away to you! The longer you cook the bones the more goodness will be drawn out and thus the more nourishing the broth will be. The test to see if your broth contains enough gelatin is when you chill it – it should thicken even to the point of jelling completely. Stock can be made in bulk and stored until needed – great to pour into ice cube trays and throw into meals adhock – especially if you’re trying to disguise it for the kids! One cup a day would be marvellous!